I have been recently looking at various activity monitors and apps as I am developing an interest into stress related research and wellness. Most of the research published in this field in the last twenty years suffers in fact from lack of technology to quantify more aspects of wellness and physical activity. Original studies in this field had to rely on questionnaires (reported activity/sleep/food intake), but now with the development of small portable technology measurement opportunities have improved. In the last few years I used mainly heart rate monitors, actigraphs, and the sensewear armband to look at activity patterns, energy expenditure and sleeping patterns of athletes. 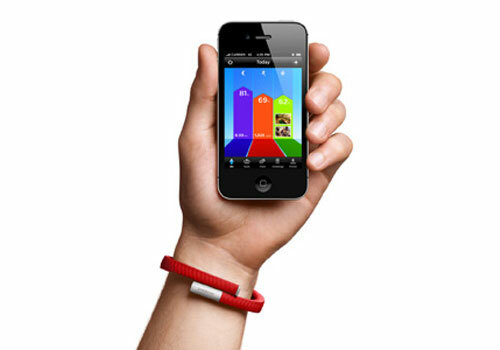 One of the most interesting tools I have come across is the Jawbone bracelet and its iPhone® app. Jawbone seems to be a true wellness device. In fact it is capable of tracking your activity, your sleep and your meals. The Jawbone band has a built-in precision motion sensor that automatically tracks your movement (steps, distance, calories burned, pace, intensity level and active vs inactive time ) and sleep (hours slept, time to fall asleep, light vs. deep sleep and sleep quality). No information is available on validity and reliability of its measurements, and at the moment I am not aware of any study published using it. The reviews from various bloggers and magazines (see this one on Wired) have been positive. However I still have not managed to see one in action as it has been impossible to buy one online (perennially out of stock). If I can get hold of one, I promise I will write about it. This seems to be potentially a great product for wellness and elite sport which can allow us to understand more about activity patterns, sleep and eating patterns of our athletes/clients. If it is precise and reliable. 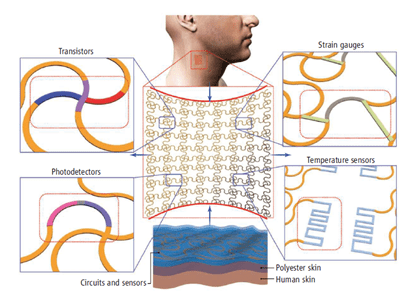 I have been recently reading a lot about epidermal electronics. Pretty soon patients in hospitals (and sports people) should be able to wear skin mounted electrodes to be able to measure a variety of physiological indicators in real time for a prolonged period of time. The latest innovation comes from the University of Illinois. A new device looking like a tattoo, has been developed and proposed as an innovative smart skin solution. Researchers at the University of Illinois who came up with this device made circuits with a wide array of components, to prove it could work: sensors, LEDs, transistors, radio frequency capacitors and wireless antennas. The devices can draw power from induction or even from mini solar cells! Inventors say they could be used for various medical applications, especially sensors that monitor heart and muscle activity, which currently require conductive gels and/or relatively bulky equipment. To prove it, they measured electrical activity produced by the heart, brain, and skeletal muscles, some data are reported in Science. You can also see a video of the technology below. Pretty impressive technology which will be hopefully available soon! 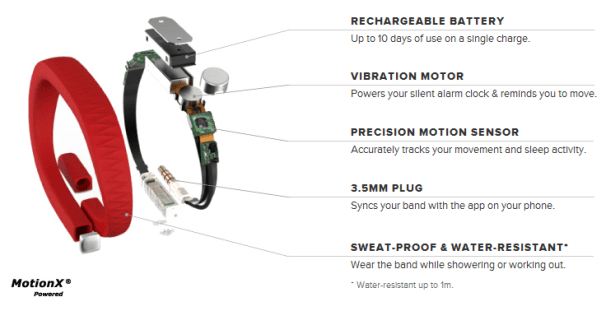 This is impressive technology, pushing the boundaries of wearable sensors and providing incredible possibilities for studying human movement. You can learn more about this and other technologies developed by Professor Rogers’ group here.